Windows Vista and Windows 7 create so called shadow copies automatically from time to time. A shadow copy of a file is basically a backup of that file. That's helpful when a file needs to be restored to a previous version, for instance after a failed update or software installation. All Windows Vista and Windows 7 users can make use of the Shadow Copy feature natively with the exception of Windows Vista Home users. 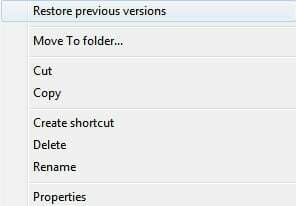 Windows 7 users can for instance access the feature by right-clicking on a file in Windows Explorer and selecting the Restore Previous Versions context menu entry. The feature is turned on in all editions of Vista and Windows 7 by default. The hard drive partition, date and time are selectable at the top of the application. Shadow Explorer displays recoverable files grouped into their folders on the left side. Both files and folders can be exported with a right-click and the selection of export from the menu. The main advantage of Shadow Copy is the interface which is easier to navigate and use, especially if multiple files or folders need to be recovered on the system. A lot has changed since our first review in 2008. Shadow Copy for instance does not need elevated privileges anymore to run. The latest version is now showing all modified, accessed and created timestamps as well which are preserved when files or folders are exported. Shadow Explorer is available for download from the developer website. It is available for 32-bit and 64-bit editions of Windows Vista and Windows 7.
as an fyi, didn’t close your link tag. ShadowExplorer also seems to be abandoned… guess those tools are not that popular and the developers get bored after the initial quest to bring light into System Restore. Still, thanks for the tip, Martin. Did not notice that. But this program is at least out of beta, so it may be the better choice after all.